It was 2am and I was awoken by the sound of little noises coming from the bassinette next to me. They started out as just little noises and then transitioned into crying. I dragged myself out from under the covers, reached into the bassinette and grabbed the cute little noise maker. I stumbled wearily into the next room to change a diaper and feed a hungry baby. I was feeling tired and my energy was low, but I knew I needed to start pushing myself in my training again if I wanted to build up my fitness. I really wanted to get back in shape, so I knew I was going to have to find the energy and motivation somehow. 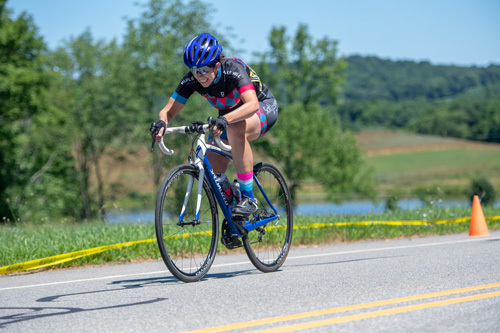 In spite of my lack of sleep and lack of fitness, I really missed racing my bike and was anxious to get back to it. 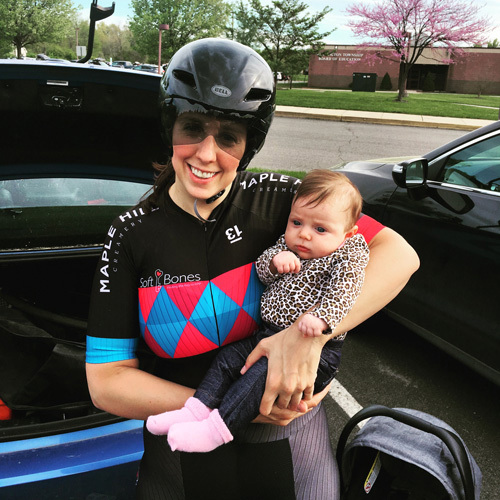 Getting back into cycling after having a baby had been more humbling and challenging than I hoped it might be. I dusted off my time trial bike, inflating the tires that were literally at zero PSI, hunted for my funny looking pointy helmet, and was ready to race, at least equipment wise. Standing at the starting line, I was nervous and excited. I was able to forget about the hours of sleep and months of training I had missed out on and turned my focus to the task at hand. In this first race, I did the best I could, but it was definitely far from my best. I felt a bit uncomfortable on the time trial bike and my legs didn’t feel smooth and powerful like they used to. I found it difficult to push myself for a longer stretch of time so soon after having the baby. However, this first race did give me a fitness boost. I could feel my legs starting to come back to life after being forced to push hard again for the first time in a long time. I decided to keep pushing onward and upward and registered for another time trial and my first post-baby criterium the following weekend. At 3:45am the following Saturday it was not that sound of cute baby noises that woke me, but the sound of my alarm. I didn’t have to leave until 5:15, but I could no longer just roll out of bed, grab my bike and my bag and go. I had to get up and take care of another tiny human, whose sweet little smiles made waking up at 3:45 not seem quite as terrible. I changed her, I fed her, I found the energy to brush my teeth and get dressed and then it was time to head out. In addition to waking up ridiculously early, my second time trial was made even more epic by the terrible pouring rain on race day. Although, the weather was far from ideal, I still wanted to get that next race under my belt. I was still not at one hundred percent, but I did feel a little bit better and stronger than I had the weekend before. My competition was limited that day due to the undesirable conditions. So even though my finishing time wasn’t stellar, I managed to get a second-place finish in my field on my daughter’s three-month birthday. The very next day I was registered for the state criterium championships. I fully expected to get dropped from this race, even more so when it was announced right before the race that the women’s fields would be combined and I would be racing against not only the category 4/5 women, but the higher category women as well. I was just hoping to hang on for as long as possible, but by the end of the first lap I was dropped. Did I take it with a smile? Yes. What else was I to do? Only about a month before that I was just getting off the couch and onto my bike for the first time since giving birth, which in my case involved somewhat major abdominal surgery. I spent seven weeks on that couch recovering from surgery and at least twenty weeks before that not being able to push or train the way that I was used to. So, after about a half a year of not really training, getting dropped was definitely to be expected. 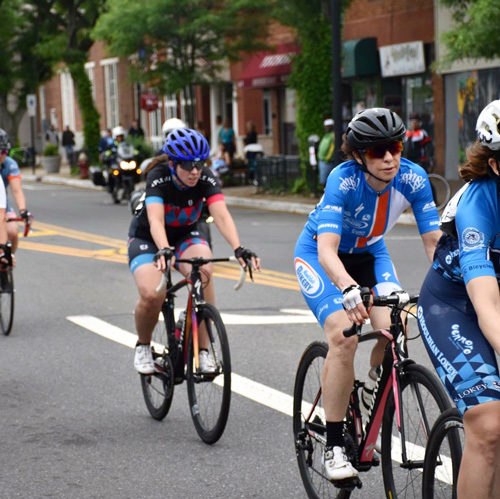 There was another big race coming up the following weekend, the Tour of Somerville. 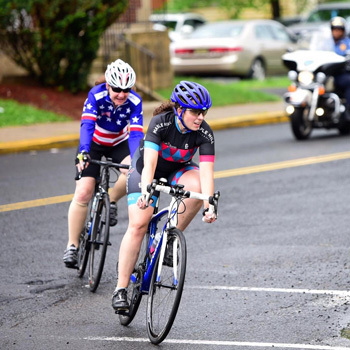 This race, unlike many other local amateur bike races was on Memorial Day and is always well attended by spectators. I had to decide if I was ready to try to race again so soon. Did I really want to get dropped again in front of all of those people? I decided that maybe the pressure of all those spectators would make me push myself harder and so I made the decision to register. On the day of the race, I handed the baby off to my husband and headed off to warm up. I was pretty sure my legs felt terrible. I had high hopes, but low expectations, especially after getting dropped so early in the race the weekend before. Trying to keep my thoughts positive, I lined up with the other women in my field and rolled through the start line. The race picked up speed quickly, but amazingly my legs felt pretty good. I was working hard, but felt strong and comfortable hanging onto the back of the field. As the laps went by I found I was still hanging on! With about three laps to go I was starting to lose steam and then a minor crash happened which broke my concentration and I was finally dropped. 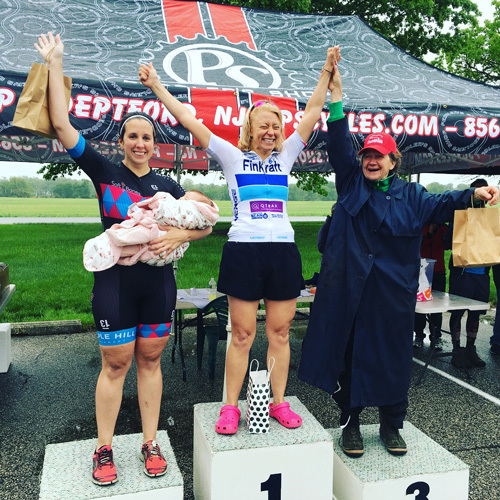 Even though I was dropped at the end I was thrilled that I had felt so good for most of the race and hung in there with women who had been training all winter while I had been very pregnant/giving birth. I definitely have lower expectations for myself this racing season, but it feels good to get back out there and be able to slowly make my way back to being competitive. 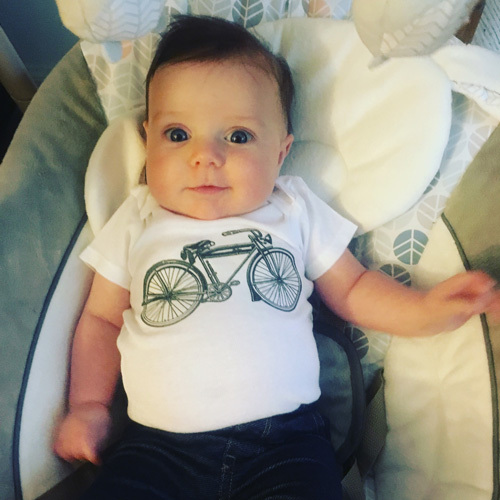 Having a baby is definitely life changing, but it doesn’t mean you have to give up on your future goals in cycling or whatever your sport or hobby may be. It helps that I have a supportive partner in my husband, but even still, I definitely have had to adapt my training routine. However, in the end, I think it will be even more rewarding to be able to achieve my goals while finding the balance of taking on the new role of being a mom.